Mriya resort between the mountains and sea. Foreign tourists who like filling out blank spots on their global map and spending their vacations in style should check out this new resort. RIR editor’s note: More than two years have passed since a referendum was held in Crimea, leading to a treaty being signed between the peninsula and Russia. This has been the source of enormous controversy between Russia, Ukraine and the West, and many foreign embassies warn against travel here. A result of economic sanctions passed in response to this event means travelling is not easy in Crimea. Practically no international airlines land here and visitors must bring fistfuls of cash with them. Bank cards and credit cards are not accepted everywhere, although it is possible to change foreign currency in banks. Driving toward the Mriya resort complex, around 17 miles from Yalta, the road meanders through two powerful sceneries: turquoise of the Black Sea on the left and the motley rocks of the Ai-Petri mountain peak on the right. Rust-coloured leaves fall from the trees and land on the windshield, like in the movies. The Mriya Resort & Spa emerges from behind the woods, its outline resembling not a hotel, but the wings of a giant butterfly or an enormous lotus flower. The employees at this Crimean resort complex claim that the concept of the Mriya project was designed by a British architect, Sir Norman Foster, whose most celebrated works include the Millennium Bridge in London, the Torre Caja skyscraper in Madrid, St. Mary Axe in London and the Hearst Tower in New York. (We must note that we haven't found any proof of Foster's involvement in this project.) In Ukrainian, mriya means "dream." It is possible to get to Mriya Resort & Spa from Simferopol Airport in a business-class sedan transfer that the complex can arrange, or by an epic 30-minute helicopter ride along the Black Sea coast. For curious travellers, who never shy away from challenges, a third option is available: You can take the longest trolleybus route in the world – an astonishing 53-mile ride. There are a few five-star hotels in Crimea – one in Yevpatoria, two in Sevastopol and four in Yalta – but such a resort complex has no equal. However, after a couple of days of luxury among the swimming pools and spa salons, you might be in the mood for more active pastimes, and even helicopter tours or mountain hikes might not be enough. This is when Mriya's advantageous location comes in handy: It is located just a half-hour drive to Yalta and an hour to Sevastopol. 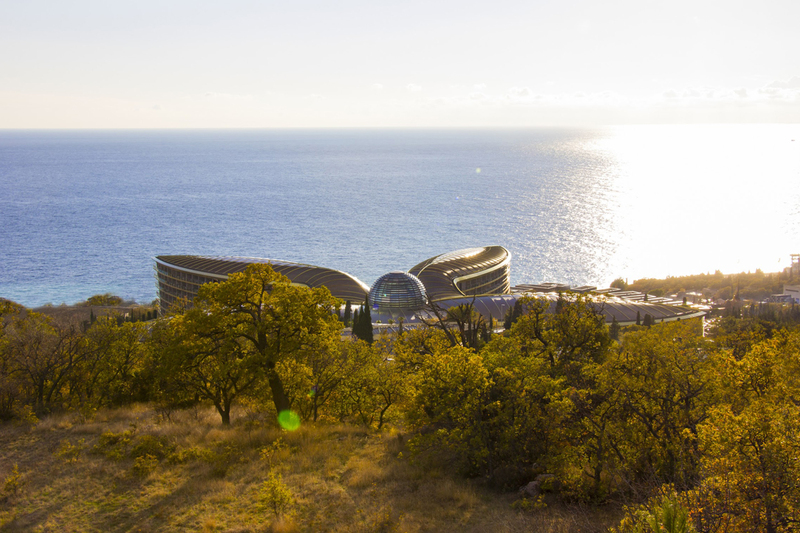 Use the resort as the base camp to explore the entire southern coast of Crimea. One can hire a yacht to sail to the Balaclava Bay near Sevastopol – sometimes called the local Monte Carlo – where flocks of motorboats float gently on the water. The land here hides a once-secret underground plant where submarines are repaired; this one-of-a-kind facility is today open to the public. If staying in a sea-view royal deluxe suite or a private villa with an illuminated swimming pool at Mriya Resort is really attractive, one can compare the experience to Winston Churchill's "apartments," where the British Prime Minister stayed during the Yalta Conference in 1945. Six miles from the resort along the shore in the direction of Yalta is the Vorontsovsky Palace, where the entire British delegation set up camp 70 years ago. The last conference between Roosevelt, Stalin and Churchill was held at the Livadia Palace in Yalta. They discussed post-war international relations in the luxurious interiors of the royal family's former summer residence. Stalin's personal belongings and embroideries made by the Romanov princesses are on display in adjacent halls. On the southern coast of Crimea, the mountains come close to the sea and plunge their vertical slopes right into the water, creating amazing conditions for an extreme type of rock-climbing called "deep water solo." The only safety “insurance” you have with such a climbing method is the water below. If you have never tried rock-climbing but want to try, it is possible to find relatively easy, but enjoyable routes at the Koshka, Diva and Krylo Lebedya climbing areas, located less than a half-hour drive from Mriya in the direction of Simeiz. There is a lacy pattern of weathering there and light-gray rocks soar above the coastline – a perfect landscape for those who can’t choose between the mountains and the lush, clear blue sea.